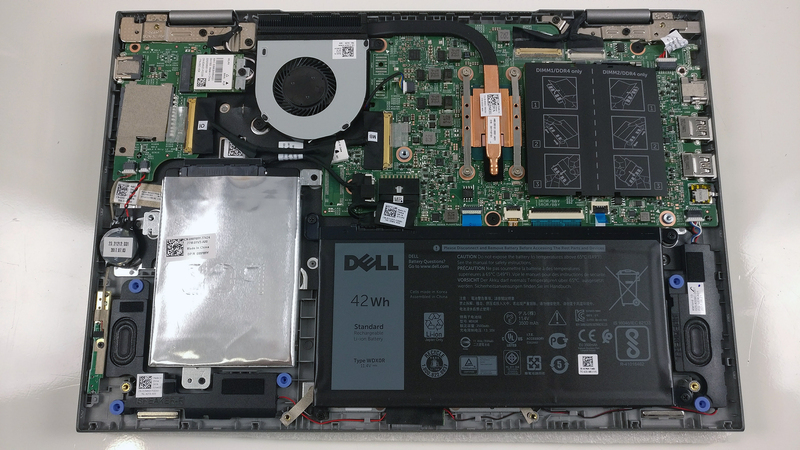 From the Dell Inspiron 15 5578 to the Inspiron 15 5579, changes are mostly under the hood. Now the notebook comes at a new price, which in our opinion is a little bit too high but also has something to offer in return – the brand new Core i7-8550U CPU on board relying on Intel’s UHD 620 integrated graphics for graphically intensive tasks. What hasn’t been changed, however, is the chassis. 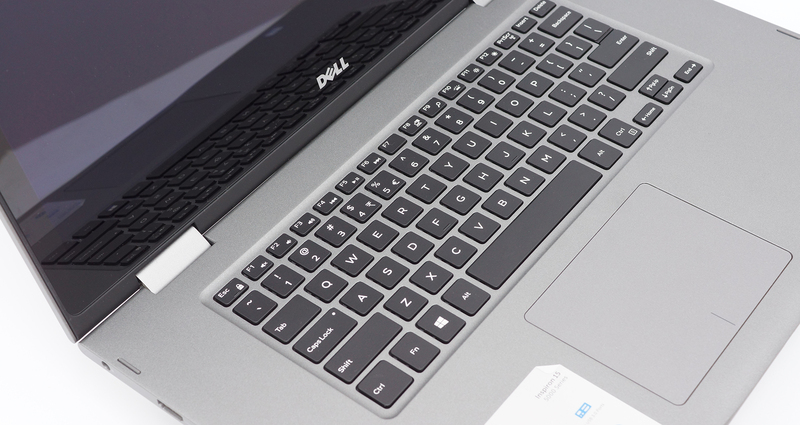 Sporting an identical shell, the Inspiron 15 5579 delivered a similar feel while working on it but we would like to see how the hardware changes have reflected on the overall user experience. Also, with the higher price, we expected a bit better screen since the one in the previous model suited only the lower-end to mid-range configurations. 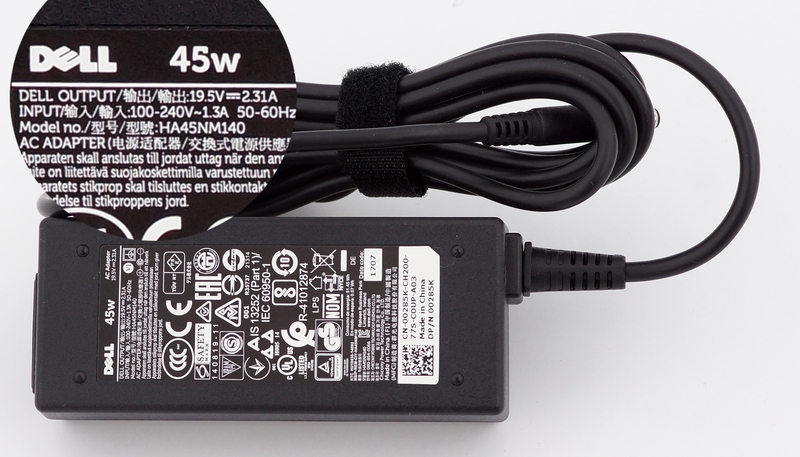 The retail package contains the usual stuff like AC adapter, power cord and the laptop itself. 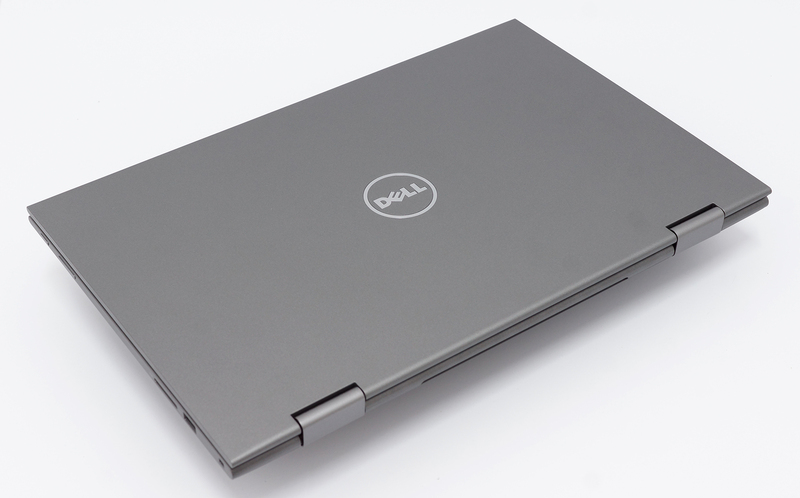 As we already pointed out, the Inspiron 5579 comes in the same clamshell as its predecessor, the Inspiron 5578, although considerably lighter now weighing approximately 2.05 kg. 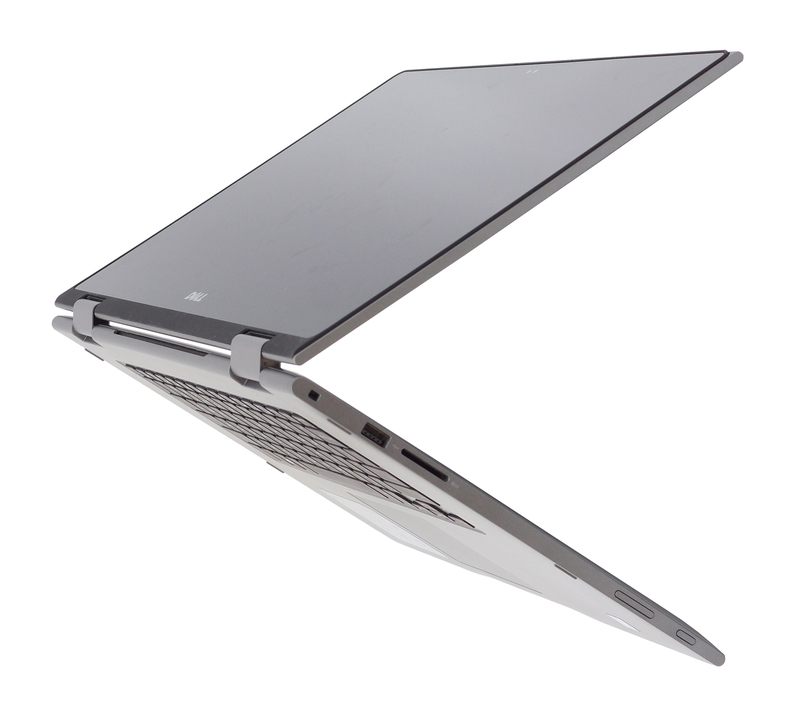 And with a thickness of just 20.2 mm, it definitely falls into the “portable 15-inch” category. Probably the main reason for this is the plastic as main material and luckily, this hasn’t reflected negatively on the overall sturdiness. Probably the only flexible part of this notebook is the lid – the back of the screen bounces when pressed and it isn’t resistant to torsion at all. We’ve let that one slip by in the previous version but since the price has been upped, it’s hard to do so right now. 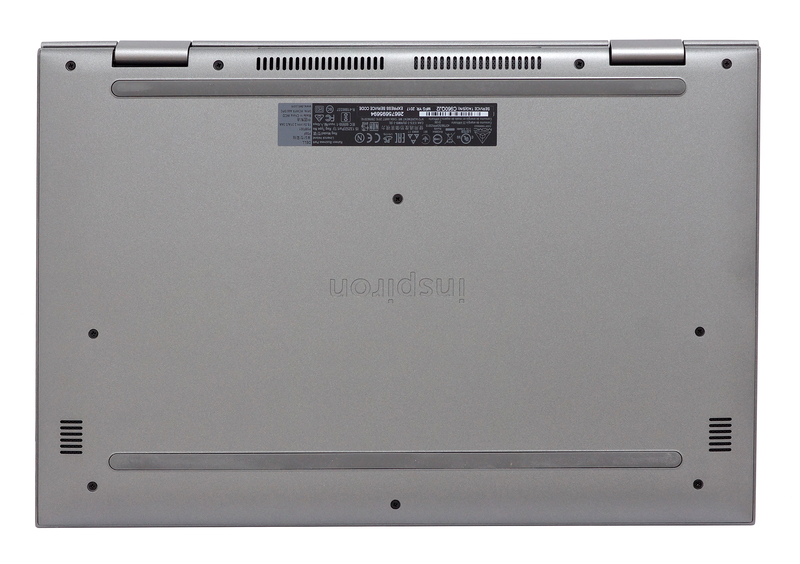 The hinges feel a bit overly-tightened, yet they fail to keep the lid from bouncing when working on the touchscreen in laptop mode. And when flipped to tablet mode, the sharp angles don’t feel good in the hands. Still, the bottom plastic sheet delivers enough sturdiness. The sides are flat as before and offer identical port placement – the left one carries the DC charging port, full-sized HDMI, two USB 3.0 connectors and a 3.5 mm audio jack. While on the right, you will find just one USB 2.0 port and the SD card reader. It seems that the usual USB-C connector, which comes as a standard for even cheaper models, is still missing here. 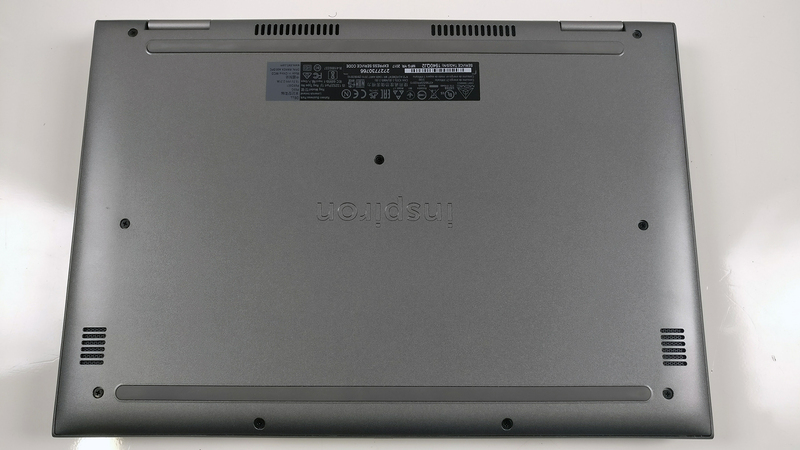 As you open the laptop, you will immediately notice the lack of Numpad area, which might be a letdown for some users since this is a 15-inch laptop but in our opinion, the more centered layout of the keyboard makes up for a more comfortable typing and a smart decision for a convertible. Speaking of the keyboard, the keys provide clicky feedback with a bit shot key travel while still delivering good typing experience. The touchpad appears to be even better than the keyboard with light mouse clicks, responsive surface, although a bit roughened and not optimal for gliding. The input devices are surrounded by solid plastic surface giving a pretty robust feel to the whole base. 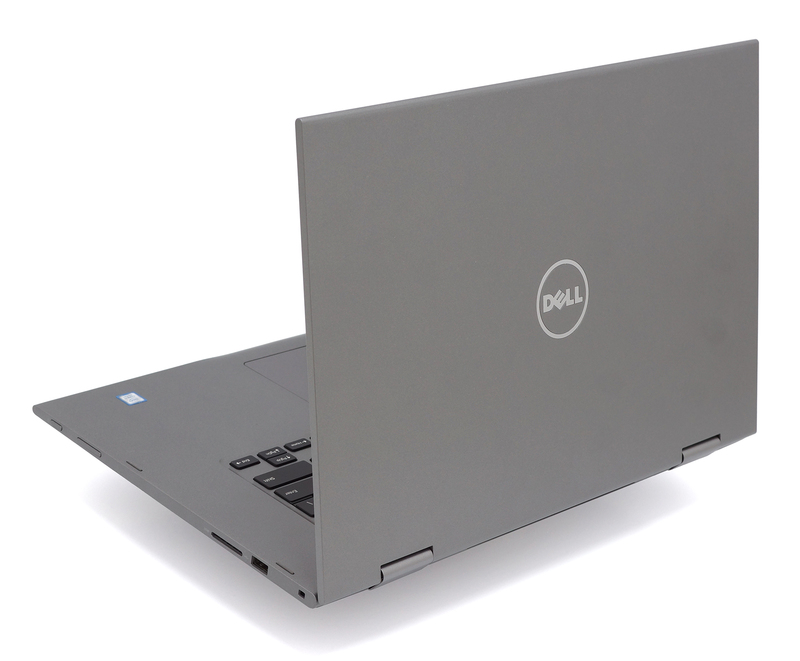 At the end of the day, the Inspiron 5579 doesn’t really impress with premium build or exceptionally robust chassis (our only complaint is the flimsy lid and bouncy hinges) given the price range. In addition, the I/O is rather limited in our opinion – there’s a missing USB-C connector or at least one more USB-A and the sharp edges make the device a bit awkward to hold in tablet mode. In any case, the input devices are comfortable and should get the work done on the go without any apparent issues. 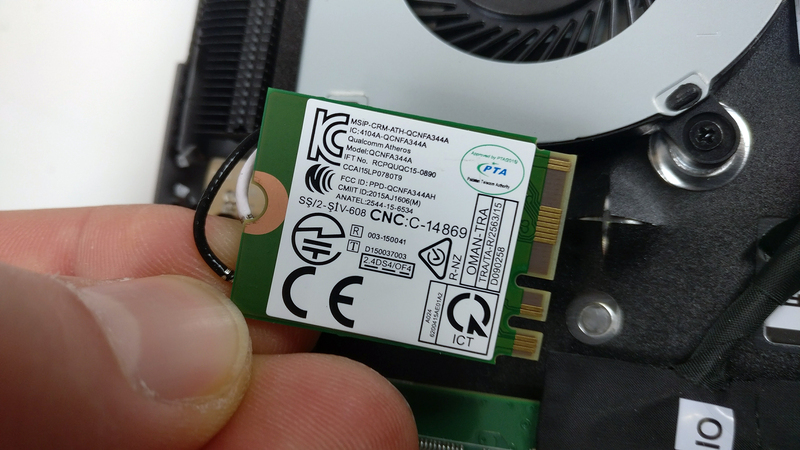 There are no service lids providing fast access to the internals but the bottom piece can be removed quite easily. Just make sure you’ve removed all the screws on the bottom before prying it up. 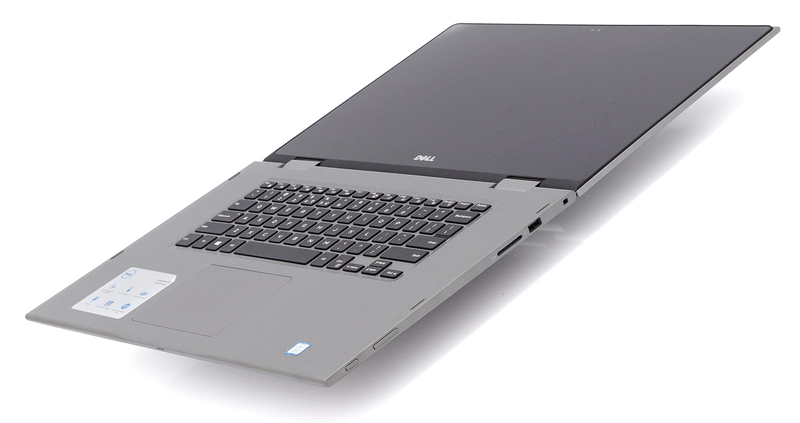 To our big surprise, the laptop comes only with a 2.5-inch drive while the M.2 SSD slot is nowhere to be found. 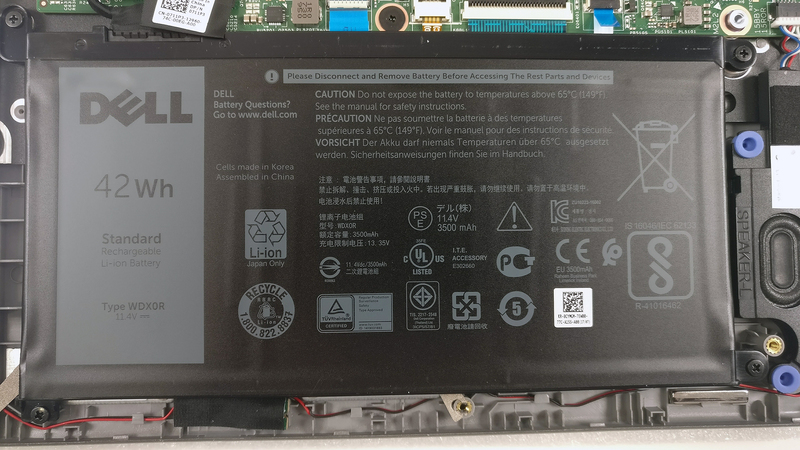 It seems like Dell just stuck the new CPU in there without making any improvements to the unit whatsoever. 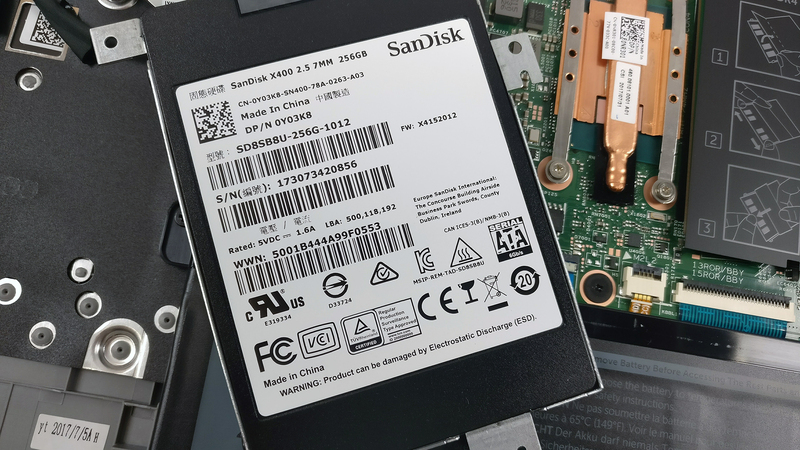 Anyway, the unit we’ve tested shipped with SanDisk X400 2.5-inch SATA SSD with 256GB capacity. 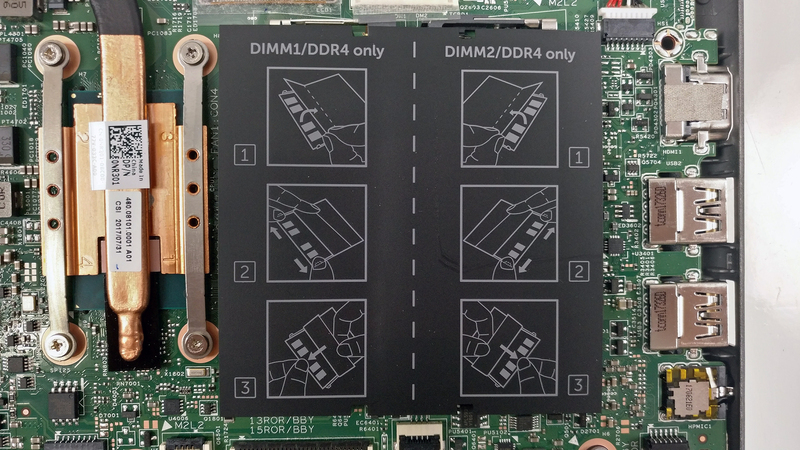 On contrary to the storage configuration, the motherboard supports two RAM slots each going up to 16GB of DDR4-2400 memory. 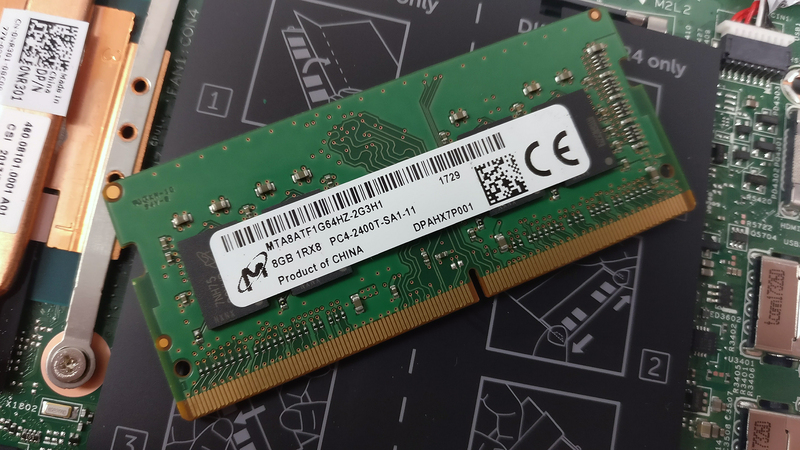 Our unit arrived with one 8GB DDR4-2400 chips from Micron. The battery unit is placed under the palm rest area and it’s rated at 42Wh. A small heatpipe connected to the cooling fan take care of all the cooling, which appears to be sufficient for the given setup. 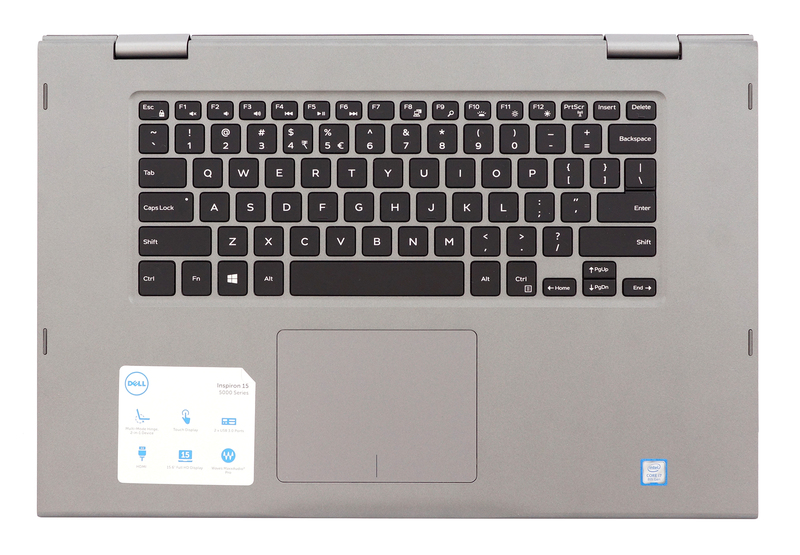 The Inspiron 15 5579 uses a Full HD (1920×1080) touchscreen with AUO B156HAB (0079Y) IPS panel delivering 142 ppi pixel density and 0.18 x 0.18 mm pixel pitch. The screen can be considered as “Retina” when viewed from a at least 60 cm. The maximum recorded brightness is just 228 cd/m2 while the average across the surface is again 228 cd/m2 with only 13% deviation. The correlated color temperature at maximum brightness is 6080K so colors will appear slightly warmer. As we go along the grayscale, the color temperature remains mostly the same – 6000K. You can see how these values change at 140 cd/m2 (59% brightness). 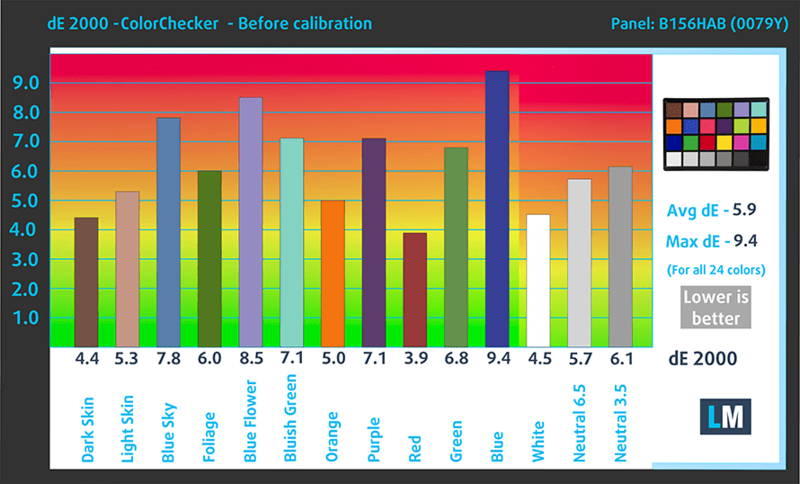 The maximum color deviation (dE2000) compared to the center of the screen at 59% brightness is 2.0, which is mostly good since values above 4.0 are unwanted. And as for the contrast ratio, it’s quite high – 1550:1 (1410:1 after calibration). Unfortunately, the display covers just 50% of the sRGB so half of the HDTV colors won’t be reproduced. We didn’t record PWM at any brightness level so using the screen for long periods of time shouldn’t cause any discomfort in this regard even to users with sensitive eyes. The panel has its perks but unfortunately, the drawbacks outweigh the pros by a considerable margin. Given price point of the Inspiron 5579, we were expecting something more than just a budget IPS panel with limited sRGB and low maximum brightness. However, the high contrast ratio and the absence of PWM might appeal to some users although, don’t expect the best multimedia experience. The sound quality is decent without any noticeable distortions in the low, mid or high frequencies. The battery life on this thing isn’t exactly breath-taking but it does the job pretty well for a 15-inch laptop with Full HD IPS screen. Let’s say it’s a little a above average despite the rather small 42Wh unit. Probably the main contributor for the longer than expected battery runtimes is the new Core i7-8550U on board. Overall good web browsing runtime – 485 minutes (8 hours and 5 minutes). Lower but still decent score on the video playback test – 414 minutes (6 hours and 54 minutes). Of course, the laptop isn’t made for gaming, especially away from the power source but it’s good to know that it can run at least two hours away from the plug – 145 minutes (2 hours and 25 minutes). Here you can see an approximate comparison between the CPUs that can be found in the Dell Inspiron 15 5579 models on the market. 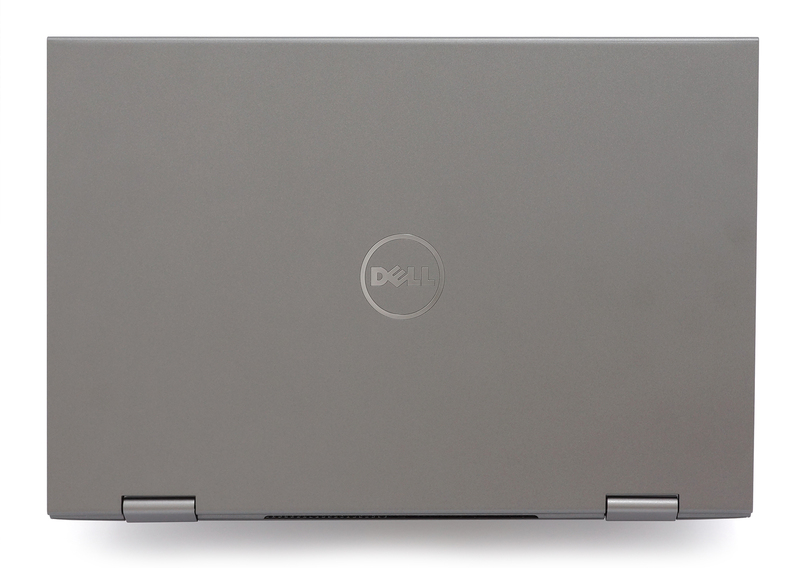 This way you can decide for yourself which Dell Inspiron 15 5579 model is the best bang for your buck. Fritz is a chess benchmark that tests the computing capabilities of the CPU with various chess moves. 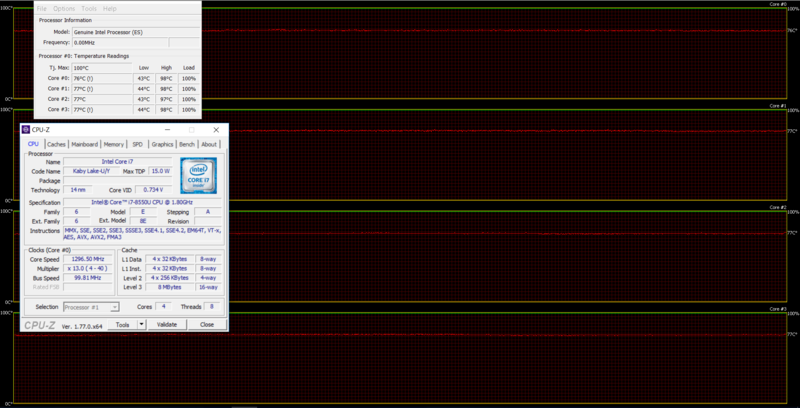 The Intel Core i7-8550U managed to get 12.385 million moves per second. For comparison, one of the most powerful computers, Deep(er) Blue, was able to squeeze out 200 million moves per second. In 1997 Deep(er) Blue even beat the famous Garry Kasparov with 3.5 to 2.5. The stress tests that we perform don’t represent real-life usage but they seem to be just fine when assessing the overall stability and effectiveness of the cooling system, especially in the long run. We started off with 100% CPU load for about an hour and observed good CPU utilization overall. The Core i7-8550U fluctuated between 3.4 and 3.7 GHz for a while before settling down to 2.7 – 2.8 for more than a minute. Slowly after, the cores retained frequencies between 2.1 and 2.3 GHz, which is still within the Turbo Boost range. It’s obvious, even from the benchmark results, that the 15-inch Inspiron 5579 utilizes the new generation of chips from Intel quite well. And as expected, when turning on the GPU stress test as well, the CPU cores started throttling in order to give enough headroom for the iGPU (UHD Graphics 620) to perform. 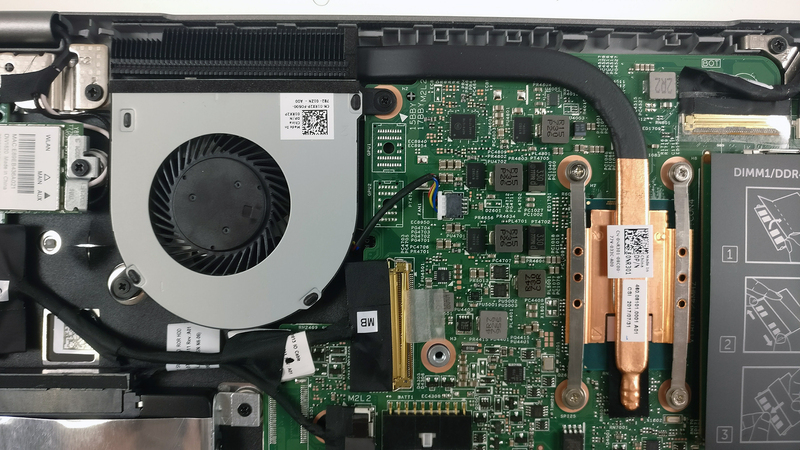 Temperatures on the surface were normal, given the circumstances, and we also observed the same fan curve as the one we saw with the 13-inch Inspiron 5379. During peak performance of the Core i7-8550U, the cooling fans were spinning pretty fast but when slowing down, the sound from the blades was barely noticeable. Surely, performance isn’t the deciding and the only factor when users look for a new daily driver so it has to impress in other areas. Stable overall chassis is one of the things we liked about the Inspiron 5579 and the comfortable input devices were the other strong suit of the device. Battery life isn’t amazing but it’s above average for a 15-incher, probably thanks to the more efficient 8th Generation processor. However, we can’t get over the notion of an outdated design (sharp corners making it uncomfortable to hold in tablet mode and hefty chassis) and the lack of 2017 features. There’s no USB-C connector (or at least another USB-A 3.0 port that can replace the latter), there’s no support for M.2 SSDs (even SATA ones) and the rather suboptimal image quality delivered by the budget IPS panel doesn’t allow us to give a positive score overall. How about photo editing…its suit for photo editing ( cpu performance and screen glare) ?